PA chief negotiator claims Netanyahu's "policies" are to blame for terror wave, refuses to condemn attacks on Israelis. 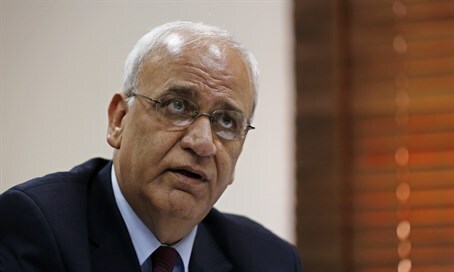 Hours after Palestinian Arab terrorists carried out four stabbing attacks in Israel, including one in which a soldier was murdered, the Palestinian Authority’s (PA) chief negotiator Saeb Erekat blamed Israel - and specifically Prime Minister Binyamin Netanyahu - for the latest unrest. Speaking to the AFP news agency ahead of a visit to the region by Secretary of State John Kerry, Erekat said he did not condone killings, but declined to outright condemn the wave of Palestinian attacks targeting Israelis. "Yes, and I hold him responsible. I hold him responsible for this deterioration," he charged. Erekat accused Netanyahu of cutting off the hopes of young Palestinians by refusing to recognize a Palestinian state according to the pre-1967 borders and allowing construction in Judea and Samaria to continue, among other issues. "We really hope, and I really hope against hope, that Mr. Kerry will succeed in getting from Netanyahu a commitment to carry out his obligations," Erekat told AFP. He said later that PA chairman Mahmoud Abbas "promised Kerry that we will not move until he comes, so it depends on what he brings tomorrow. "But then after that, if Netanyahu continues his games of settlements, dictations, destroying the two-state solution, there will be major, major decisions," threatened Erekat. But he did not mention the constant incitement to terrorism against Israelis by Palestinian Authority officials, including in the official PA media and by Abbas himself, most notably his call on Palestinian Arabs not to allow Jews to enter the Temple Mount with their “filthy feet”. Asked by AFP if he saw a need to condemn the Palestinian attacks, Erekat replied, "I condemn those who destroy hope,". "I condemn those who chose settlements and dictation rather than peace and negotiations. And I told you I don't condone the killing of civilians, given it is Israelis or Palestinians,” he continued. "I'm a man of peace. I want to make peace. I recognize Israel's right to exist," claimed Erekat, though he said that an international investigation was needed to probe allegations of extrajudicial killings and excessive force by Israelis, and warned that "things are deteriorating. Things are slipping outside our fingers like sand." Erekat said that "when you simply speak about people dying, those people dying are my children and my grandchildren. They are the same people we are supposed to give better lives to. "That's what we promised. But OK, I tell him now: You succeeded Mr. Netanyahu. You destroyed the two-state solution. You destroyed (the) Palestinian moderate camp," he added. Abbas, in his speech to the United Nations in September, said he was no longer bound by the Oslo Accords with Israel, saying "we will not remain the only ones committed to the implementation of these agreements." "We want people to start asking Netanyahu to put his money where his mouth is," Erekat said. "We want deeds, not words."